Team placement dates have been changed to a later date than was originally listed on your receipt. Registration Deadline is April 12th for Coach Pitch, T-Ball, and Kickball. A $10 late fee will be added until leagues are filled, then a waiting list is utilized. HS Boys Colt and HS Girls Phoenix Registration is open March 25 – May 10. Leagues are based on current school grade at the time of registration. Team Placements for 5th-6th grade leagues on March 6th at Community Park Springville Fieldhouse (previously Springville Community Pool, 1015 E 900 S) at 6 pm for Girls and 7 pm for Boys. Team Placements for 7th-8th-9th grade leagues will be held on March 7th at Community Park Springville Fieldhouse (previously Springville Community Pool, 1015 E 900 S) at 6 pm for Girls and 7 pm for Boys. SPRING SOCCER REGISTRATION Deadline was February 22nd, but continues until leagues are filled. A $10 late fee is added after the deadline. A waiting list is utilized after the league is full. Flag Football for 7-8-9 grade registration continues with a $10 late fee until the league is filled. Team placements for the 7-8-9 Flag Football league were held on August 22. Late registration for 1st through 6th grade Flag Football continues with a $10 late fee until the leagues are filled, then a waiting list is utilized. Free Admission. Gates open at 7:00 pm with the movie starting at dusk (around 9 pm). General admission seating, bring your own blankets or folding chairs. Bring your own picnic snacks, or enjoy concessions provided by various local Food Trucks! More info about the food trucks will be coming soon. For the safety and enjoyment of everyone, NO ALCOHOL BEVERAGES OR DOGS ALLOWED. Anyone causing a distraction or disturbance will be required to leave. In recognition of all Springville City’s fun, exciting new swimming areas at Clyde Recreation Center, along with the beach and lake at Bartholomew Park, as well as the Splash Pad located downtown at Civic Center Park, we invite everyone to SPLASH INTO SPRINGVILLE for this year’s annual Art City Days! 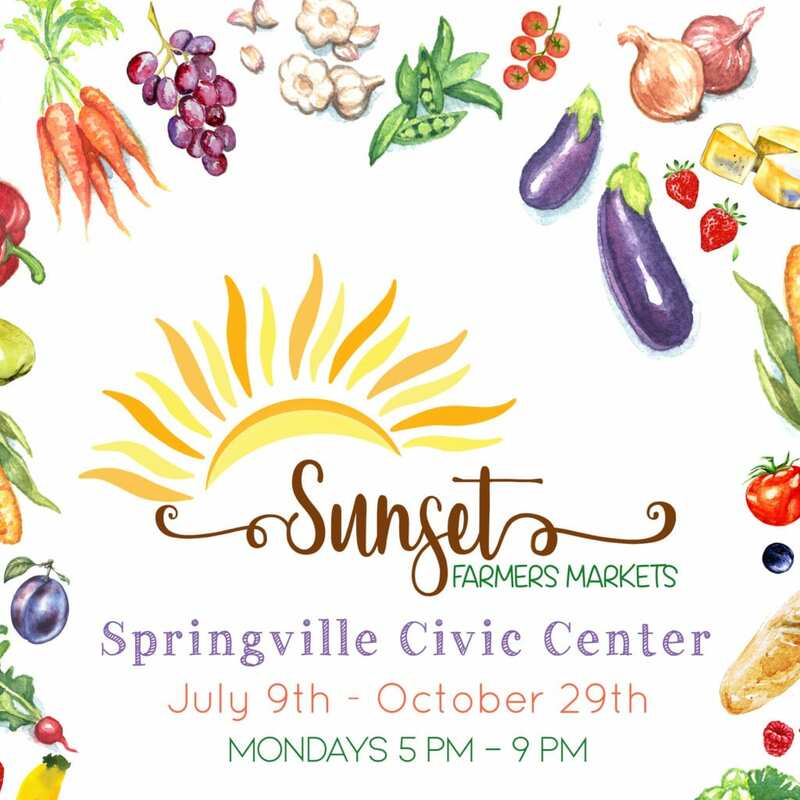 Springville City Art City Days is a great way to start the summer! Sign up early to participate in the 5K Family Fun Run, Baby Photo Contest, Grand Parade, and more! Many of the concerts and activities are free! This annual celebration is filled with plenty of family friendly fun suitable for all ages. Construction of the Clyde Recreation Center is anticipated for completion in May! Clyde Recreation Center memberships can be pre-purchased when paid in full. Monthly payment plans not yet available. Online purchases available at www.springville.org/clyderecreationcenter or through the app after syncing with your online login. 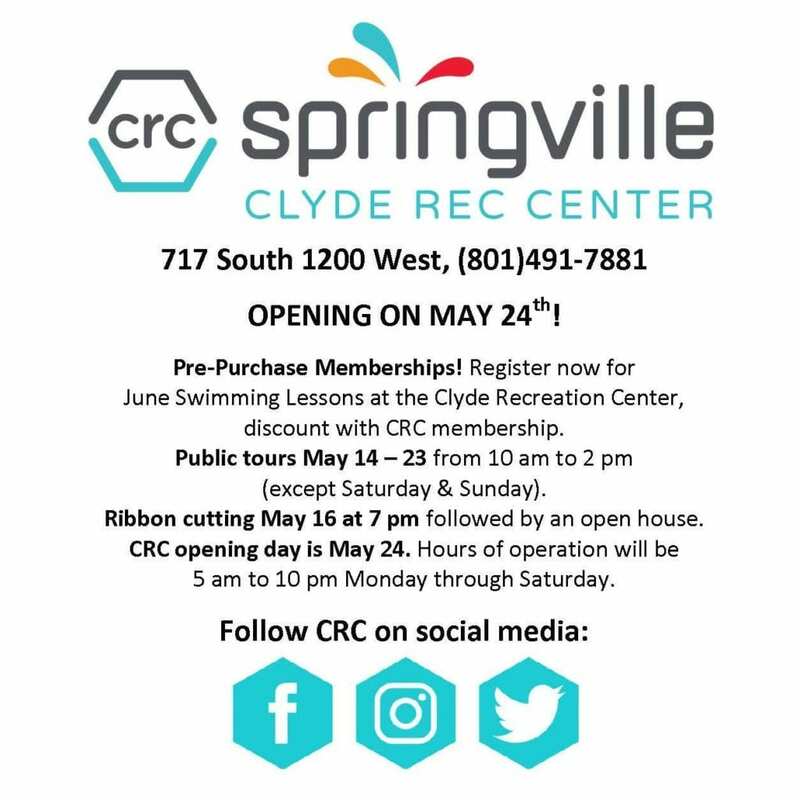 Immediate access to Springville Community Pool is included until Clyde Recreation Center is complete. To show pre-purchase, log in on the app and click upper left menu. Scroll down to “My Purchases” to show your membership plan. Membership anniversary is the first day the Clyde Recreation Center is open. Download the free Clyde Recreation Center App available for Apple and Android to plan and schedule your classes! From this mobile app you can view class schedules, sign up for classes, reserve Child Watch spots, view ongoing promotions, as well as view the Recreation Center’s amenities, location, and contact information. You can also click through to our social media pages! Optimize your time and maximize the convenience of signing up for classes from your device!